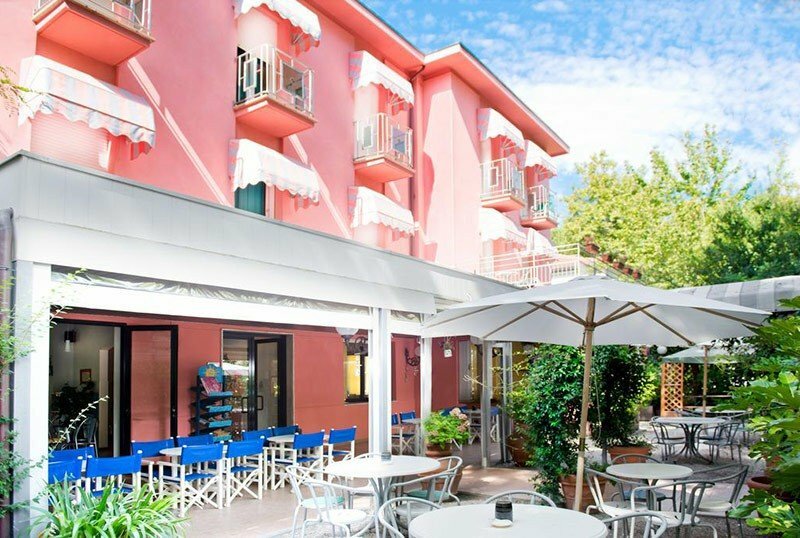 A 2-star family-run hotel, the Villa Rosa Hotel in Cesenatico offers free parking, bicycles, services for children and stands out for its attention to healthy eating. In fact, it offers organic and zero-km products, vegetarian, vegan and celiac specialties. Admits small animals, which can also access the beah affiliated with the hotel. It is located in Cesenatico in the central area, about 5 minutes walk from the beach and about ten from the Leonardo canal harbor. All rooms have a balcony, private bathroom with shower and hairdryer, satellite TV, telephone, WI-FI, air conditioning, safe. They are decorated with handmade ceramic objects. Breakfast in the room available for a fee. Garden, open-air porch, free bicycles, restaurant, bar, satellite TV room, library, reading room, free travel bag, welcome drink, free shuttle service to airport and train station. Equipped for cyclists, it also has a corner shop with jewels and gifts. CONVENTIONS: beach, shuttle service for a fee. PETS: small pets allowed, with the possibility to book the dog sitting service and access the beah affiliated with the hotel (by reservation). BREAKFAST: sweet and savory buffet with organic products, to be enjoyed in the garden. Possibility of breakfast until 12 at the hotel bar with croissants and cafeteria. LUNCH AND DINNER: traditional local cuisine with a two-choice menu based on typical specialties, even vegetarian and organic products at zero km. Water and wine at zero km included with meals. Pasta and desserts are homemade. In hotel: outdoor playground area, workshops for children, baby sitter for a fee. At meals: baby menu, baby food, bottle warmer, high chairs. The affiliated beach, Bagno Roma n. 54, has a children's playground area and entertainment. Pets allowed upon reservation. Prices are per day per person, in a double room for a minimum of 3 days. - No discounts are given to the children who occupy the room with an adult.